How do I collect progress data in LearningStone? If you are training a group or coaching an individual, you might want to know if someone has understood something, is ready for a certain event, has finished an assignment or is doing better than the rest. 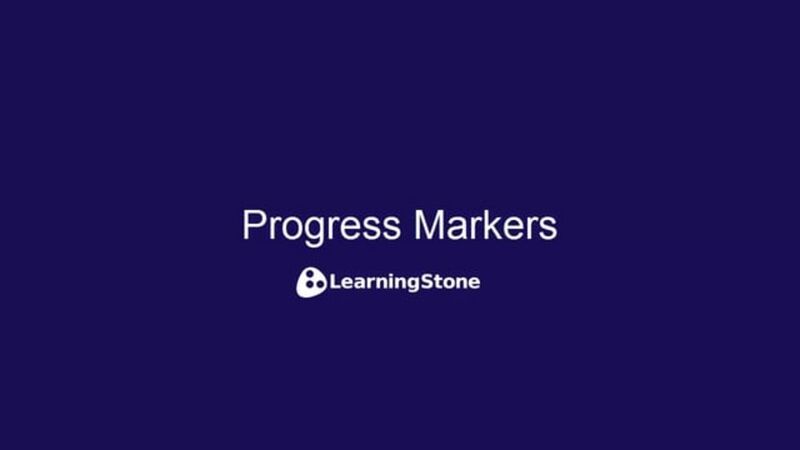 LearningStone offers “Progress Markers” which you can add to blocks in the course timeline. Please note: don’t confuse a progress marker with a form or survey which can be used for things like a test, intake or evaluation. For more information, see the help on Forms. EXAMPLES? You can find a course timeline containing progress marker examples in the “EXAMPLES” folder which you can find in the Course timeline library (See Settings > Course Timelines). Progress markers are points in a course timeline that a participant can click on to tell the coach, trainer or the other members that something has been seen, achieved or understood. You can use progress markers for simple tracking, for feedback or for gamification. A progress marker is a question that can be attached to a text block, a video or other block. They will show up as a green circle that can be checked by answering a short question or a black circle if only the coach can give the answer for something like a grade. · Course grade (text answer). You can also use answers to progress markers to conditionally show the subblocks of sections or other blocks. How do I add a Progress Markers? Click on pen-icon next to a block in the course timeline to add a progress marker. Scroll down to the bottom of the form that opens on the right. If that block-type has a progress marker option, you’ll find it here. You can add a question (text, long text, yes/no several types of multiple-choice questions or a 5-point scale). The progress marker will appear as a small green or black circle under the block of which the marker is added. How are the results of Progress Markers stored and shown? The chosen setting is also shown at the top of the progress report. If you copy a course timeline, the results are not copied. Can I create “Coach-only” Progress Markers? Yes, simply check this option when you are adding a progress marker. This could be used for a grade or other feedback from the coach or trainer. The progress marker will appear as a black (instead of green) circle with a question that can be answered by clicking on the progress report. You can hide the whole block by not publishing it or let it be visible so that the participant can see what the coach or trainer fills in. If you don’t publish the block, the results will appear grayed out in the progress report and are only visible for the coach and manager. How can I show blocks conditionally? If you add a block (e.g. a section) and then add indented subblocks to it, you can decide to conditionally show the subblocks. Choose the “Display Options” of the top level block. How can I delete my answers? Can I use the progress report for gamification? You could tell your participants to compete with each other. This could be to simply feel connected or to really speed up the learning. It’s up to you! All you need to do is add progress markers and share the progress report. Go to the course timeline settings (click on the pen-icon to edit and click on “Settings”) and choose “Shared”. The progress button will appear above the course timeline and will be available for everyone. You can always check if the progress report is being shared at the bottom of the report. Yes, just create a text course timeline block, add a progress marker with a multiple-choice question “Attended? Yes/No”. Check the “Coach or manager only” option and if you don’t want to let the members to see this, do not publish the block. Now go to the progress report and click next to each person in the right column and choose “Yes” if the person has attended. How can I export progress data? If you open a progress report, you’ll find the option of downloading the results as a CSV file or an Excel file. A CSV file is a Comma Separated File, an international standard. How do I add hidden trainer notes to the progress report? Simply add a text block with a progress marker containing an “essay” question called “Notes – private”. Call the text block something like “Trainer Notes – not published” and do not publish this block. Now you can enter notes in progress report. You will see that the results will appear light grey in the progress report as the block is not published – this means it will not be visible for the members. How do I create a certificate, diploma or award? If you want your participants to receive a certificate with your logo at the end of a course (or several during the course if you prefer), you simply add a Certificate Generator block to your course timeline. You can add your own background and decide if the certificates are mailed automatically at a certain date or if you prefer, you can manually decide who receives the certificates. For more info see the help on the Certificate Generator.